Jenks City Hall is located at 211 North Elm Street, Jenks, OK 74037; phone: 918-556-7410. Photo: B. W. McLean House and Office, ca. 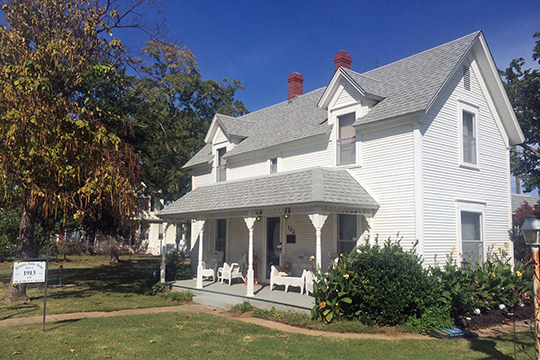 1913, 23 East A Street, Jenks, OK. Listed on the National Register of Historic Places in 1991. Photographed by user:Melodibit (own work), 2014, [cc-by-3.0 (creativecommons.org/licenses/by/3.0)], via Wikimedia Commons, August May, 2016. Jenks like most other communities in the state and nation was geographically located at an auspicious point on a major transportation route. A cooperative agreement between the Midland Valley Railroad and the Midland Valley Townsite Company established the community site along the railroad which was constructed in 1904 between Tulsa and Muskogee. The future community's location was further enhanced by the proximity of the Arkansas River, which was navigable by shallow draft steamboats when the river level was high. The new town was most influenced by the railroad though, and took its name from a director of the railroad who lived in Philadelphia. There are other unconfirmed stories, however, that claim the settlement was named in honor of a railroad conductor or engineer or for a contractor who built the train depot or for an early doctor who resided in the area. The Midland Valley Townsite Company filed the original townsite plat on July 15, 1905, but the townsite was sold to the Illinois Townsite Company soon thereafter. Lots were inexpensive at that time and ownership of lots changed frequently, sometimes during poker games. To promote the sale of lots, one Realtor sold shares of a nearby oil lease located near the mouth of Polecat Creek. No oil was found on the lease, however. Early promoters of land sales in the area also planned a baseball game to attract land buyers. The game was to be played on August 3, 1905, between Bixby area men and a team composed of men living near the Jenks depot. Influenced by a liberal amount of liquor, a free-for-all brawl ensued from an argument between two contestants over a $2 bet. Genteel spectators who came to witness the sporting event were shocked by the "swearing, carousing, and fighting". The game was never finished, and U.S. Marshalls quelled the "more enthusiastic participants" using the barrels of their Winchester rifles as clubs. The discovery of oil near Glenpool late in 1905 greatly affected Jenks' early development, and at the height of the oil boom the railroad station at Jenks did nearly $100,000 of business a month. In 1906 oil tank farms were constructed near Jenks to store oil from area oil fields. The expensive tank farms increased the area property valuation and contributed considerable revenue to the Jenks School District. Jenks experienced a rapid growth in 1906 due to the Glenpool oil discovery and boom. To meet the needs of an increasing population, a non- denominational Church was started, and services were held in the Jenks depot. New business and the first bank were also established in 1906. Not all of the early business enterprises were successful; a sawmill opened in 1906 failed two years later. In 1908, Baptist and Methodist churches were founded in Jenks and the first public school was opened. Jenks' first damaging flood occurred in 1908; another serious flood followed in 1923, and floods continued to plague the city until the Jenks levee was completed in 1949. A disastrous tank farm fire probably caused by lightning also occurred in 1908. In 1909, an unpaved highway was built and connected Jenks to Tulsa, and a bridge was constructed across the Arkansas River. Agriculture, oil and the railroad were the primary economic forces in the town's early history. Cotton was a major crop, and a cotton gin was opened in 1909. Cotton continued to be a major crop until 1915. A feed mill and a grain elevator were built in 1909, but both businesses soon failed. Oil was discovered near Jenks in 1912, and petroleum extraction and distribution were thereby established as primary industries in the town. As nearby oil fields played out, however, tank farms were dismantled, and farming regained importance. The role of agriculture in the area was further strengthened with the immigration to the Jenks area of sizable settlement of Bulgarian farmers and their families in the 1920's. Truck farming, livestock production, and dairying became the dominant activities. Throughout Jenks history the Jenks schools have played an influential role as an institution around which the community was unified. City of Jenks, OK, Jenks Comprehensive Plan 2015-2025, September, 2014, www.jenks.com, accessed August, 2016.